It’s the Doctor’s 50th anniversary today. What better time to ‘get into it’? 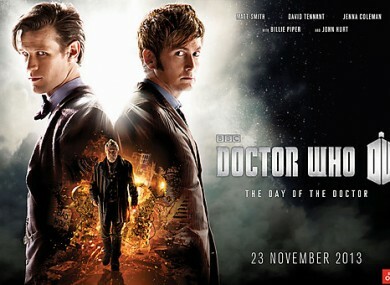 DOCTOR WHO MARKS its 50th anniversary today with a special episode broadcasting on BBC One at 7.50pm. Who cares? Well, all of the Whovians do (yes, that’s a thing). So you’ve no idea who Doctor Who is and what area of medicine he specialises in, but you want to give it a go and it seems like a LOT of work. These ten episode picks are pretty much stand alone and won’t ruin any major story arcs– they can be enjoyed alone as simply great moments of television. You have to start somewhere, so why not the beginning. This is the first episode of the Dr. Who revival and will give you an introduction to the world of the Doctor, but more importantly to Rose, aka Billie ‘Because We Want To’ Piper. It will also help you acknowledge that this show is just as much about the companion as it is the Doctor. This episode contains a bridge between old Who and new Who. Wait, what, who? It features the return of Sarah Jane Smith, one of the companions from the original series, as well as K9, the now extremely dated robot dog. Still not sold? Giles from Buffy is in it, and he’s the creepiest headmaster you’ll ever see. Here we have a love story involving 18th century France, a spaceship, clockwork robots and a horse. Do you really need another reason to watch this? Yes? OK then, you’ll learn why you should always bring a banana to a party. As if you didn’t know already. In this two part episode, the Doctor believes he is human (long story, but not important) and a teacher in an elite boy’s boarding school in 1913. Only his companion, the underrated Martha, knows his true identity and when the safety of the world is threatened by maniac scarecrows the Doctor must choose between love and his true identity. Tough break. Regarded by many as the best episode since the shows return, one watch and you will understand why. While it features very little of the Doctor himself, a young Carey Mulligan stars and the episode introduces one of the most terrifying creatures of the series, the Weeping Angels. You may never feel comfortable around statues again. The Doctor arrives in Pompeii on the eve of… well you can guess. Bad timing mate. But is there something more sinister at foot than just the mother of all volcanoes? Features latest Doctor, Peter Capaldi and future companion Karen Gillan. Another two parter, while visiting the biggest library in the universe the Doctor meets the mysterious River Song who seems to know him very well indeed. That’s the awkward thing about being a time traveller. You will most certainly be afraid of your shadow after watching. You’re welcome. You know how lots of men are in love with their car/motorbike/TV/some other inanimate object and it would probably be their dream woman if it came to life? Yeah well that kinda happens. Michael Sheen’s voice also has a starring role in the episode– not as the Doctor’s wife obviously. Travelling across space and time and still making it back in time for dinner? Sounds like a great life doesn’t it? This episode displays the downside to being a companion, and how life with the Doctor can cause insanity and force you to make some horrible decisions. If horror films are your thing, this is the episode for you. It’s 1974 and a huge manor house is being investigated by ghost hunters. Throw in two love stories and it has something for everyone, especially Dougray Scott fans. Email “Not a Doctor Who fan? Here's 10 episodes to get you started”. Feedback on “Not a Doctor Who fan? Here's 10 episodes to get you started”.